Yorkshire President Dickie Bird presents captain Andrew Gale the 2015 LV County Championship Trophy. YORKSHIRE’s fixtures for the 2016 season have been announced by the England and Wales Cricket Board. The club will begin their quest for a third successive County Championship title with a match against Hampshire at Headingley from April 17. Andrew Gale’s men face newly-promoted Lancashire in the Championship at Leeds from May 29, with the return fixture at Old Trafford from August 13. “I always look forward to fixtures day,” said captain Gale. Yorkshire face the other promoted side, Surrey, at Headingley from May 8 before travelling to the Oval on July 11. As usual, Yorkshire have six Championship home matches at Headingley and two at Scarborough. This year’s visitors to the seaside are Middlesex, whom Yorkshire play at North Marine Road from July 3, and Nottinghamshire, who visit from August 23. In addition, Yorkshire play two of their four home group games in the Royal London Cup at Scarborough. Northamptonshire are the visitors in the 50-over tournament on June 14, with Nottinghamshire also providing the opposition on July 27. 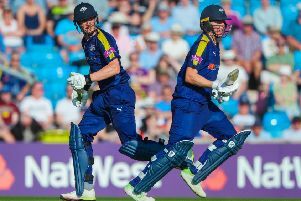 Yorkshire’s biggest match of the season in terms of numbers and revenue is the annual T20 Blast fixture against Lancashire, which takes place at Headingley on July 1. The reverse fixture at Old Trafford is on June 3. Yorkshire’s season actually starts on March 20, when they face MCC in the annual Champion County game in Abu Dhabi. The campaign ends in late September at Lord’s - the ground where Yorkshire clinched the title last summer - when they take on 2015 runners-up Middlesex.